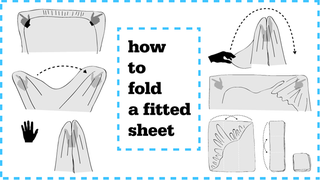 A few months ago, word started getting out that I know how to fold a fitted sheet. And once it did, the cries began: "SHE'S A WITCH! BURN HER!" And while yes, I do have a bit of a witchy bent, my ability to fold a fitted sheet actually has nothing to do with magic. Maybe a little bit. OKAY FINE, IT'S MAGIC, FINE. But it's teachable magic, and I am a benevolent, educating witch. The thing about providing instructions for folding a fitted sheet is that the writing of it, no matter how clear one is, tends to be confusing. It's just one of those tasks that is best taught by showing, rather than telling. And so that's exactly what I've done for you. Despite the fact that I hate being on camera, I love you enough that I put aside my vanity and fears — oh, god, so many fears, you guys — and made you the following video, which shows how to fold a fitted sheet. To make it even more fun, and also to prove that even people who aren't witches/don't fold fitted sheets for a living can totally do this thing, I asked my colleagues Tom Ley and Barry Petchesky to try their respective hands at it. I baked them cookies, too, which is neither here nor there, but speaks nicely to my point about being a benevolent witch. A final note for you: My method deviates ever-so-slightly from the traditional way of marrying the corners—I find my approach is easier and far less likely to result in a tangled-up sheet. But if you want to try it the other way, or are just wondering how many ways there could possibly be to fold a fitted sheet, here's The Supreme herself, Martha Stewart, demonstrating the way in which she folds a fitted sheet. Art by Jim Cooke. Video shot by Kyle Wagner and edited by Dave Mayers.